Thanks for sharing David! This is fascinating. Hi David, I thought the following may be of interest, perhaps you already know about it. 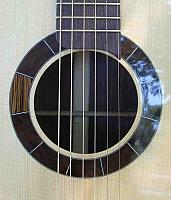 I posted a link to this thread on the forum of French luthier Benoît de Bretagne. Someone else added a message with a linkto Italian luthier Fabio Zontini who has also made a copy of the 'cardboard' guitar. There seems to be no information on his website about this guitar (apart from a photo) but there is a link to a video of someone playing it on YouTube. I don't know if I can do the YouTube link thingummy but it sounded pretty good to me. Post subject: Re: The Torres Cardboard Guitar:COMPLETE! Well, aside from a few ongoing adjustments etc. the guitar is complete. For those of you who have the Grondona and Waldner book, I've taken a number of shots from similar angles. I'm pleased with the sound of this guitar and what is most surprising is that there were few surprises! It sounds quite good, though not much like a rosewood guitar....more akin to cypress or perhaps maple with an overall dryer quality and less sustain....now the hard part..! !..I'll work on getting a sound clip posted as soon as I can. Thanks to all for their input during this project! Are you taking this to the GFA show in frisco? Well, I already have two guitars going for half a table of space so I think I'm at my limit.....! !...........but definitely to next years ASIA symposium and the 2009 GFA in Ithaca! Bravo! Thanks for sharing this with us! Very very cool. David: My hat to you!! Wonderful job. I am desperately waiting for the sound clip. Thanks for sharing. I enjoyed following this build Dave-- amazing work. What's your next project? David, this has been a fascinating thread. I must say you've corrected a lot of misconceptions I had regarding the original Torres "paper maiche" guitar. Thanks for the education! truly wonderful ! this is an amazing job ! I'm awaiting for a mp3 file ! ballet that he'd directed opening there was also friends with a museum employee. to persuade the museum crew to allow him to. obvious by its tone that there was a lot missing from its construction. I look forward to seeing what your guitar sounds like when you complete it. According to Romanillos the guitar was repaired several times and now the top is less than 1mm in places! - myself I wouldn't even attempt to string it up to pitch! let alone play it and judge tone. I am sure a newly built one as long as the top is good and of normal thickness sounds good, not as sustaining and deep as a rosewood one, but good nevertheless. Thanks for the info and your son's impressions of the guitar. There are some very good photos of it in the Gondona and Waldner book that I think may still be available from GSI. As I may have mentioned, my selection of cardboard stock differed from the original in that though the back was close (2.2 mm as compared to 1.8mm for the Torres). I used much heavier stock than he did for the sides. The presence in the original of added (according to Joshua French who examined the guitar along with Joan Pellise') slats every 3 cm or so for the the entire rim indicated to me that even Torres himself (or whoever subsequently had the work done) considered them too flimsy. It was an opportunity to eliminate all the additional stuff in the guitar and build it according to the original plan. What was also behind my choice of heavier stock was my own approach to the guaging of the back and sides of guitars in general and I chose a weight and density of cardboard that felt "right" to me according to my own experience and sensibilities. This approach made the project not only an interesting excercise in replicating a historic guitar but by extension an experiment useful to me as well. What a great thread this has been, David. I look forward to a sound clip of your guitar. hearing some audio clips of it. know? I'd love to visit there in the future since I'm a huge Gaudi enthusiast. Great job....in typical Dave LaPlante style. Congratulations on this cardboard beauty!! Excellent job! Very interesting project. I can't wait to hear the sound clips. Have heard your cardboard guitar on another forum. Again, great sound, esp. in the trebles! Thanks for the documentation. Quoting Spock, "fascinating". P.s. I think you should give the guitar a Name. Waddy T pointed out your site to me and I am really intrigued to learn more about FE-14. Thank you for posting this. I am currently downloading the soundclip (anxiously) to see what it's voice is like.